Nikon CFI60 Infinity Corrected Brightfield Objectives are designed to meet advanced imaging requirements and are the culmination of Nikon’s optical technology. The Nikon CFI60 Infinity Corrected Brightfield Objectives offer increased brightness and the highest possible combination of working distance and numerical aperture (for light gathering ability) due to the 60mm parfocal distance and a large barrel diameter. Designed to correct lateral and axial chromatic aberrations over the entire field of view, these objectives produce high contrast and high resolution images. The accessory tube lens (#58-520) can be used to focus light from the infinity corrected objective onto the image plane. 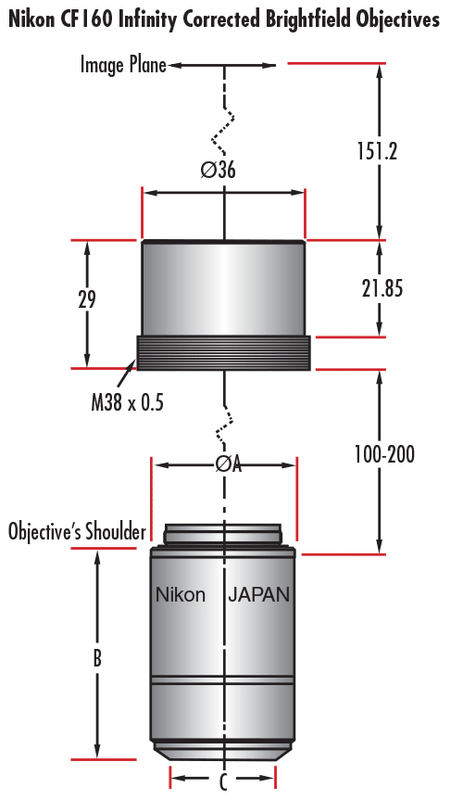 For optimal performance, the distance between the tube lens and the objective’s shoulder should be kept within 100-200mm. This spacing allows accessories to be inserted in the optical path to accommodate specific needs. This tube lens can be integrated into C-Mount systems using the Nikon Tube Lens to C-Mount Holder (#11-150).